Judging yourself for being an “emotional eater”? Emotional eating has gotten a bad rap. It’s as if we’re expected to leave our emotions behind at the dinner table. “Emotionless eating” anyone? Before my son came along, I often used the example of how babies are born knowing when they’re hungry (and boy do they know!) and knowing when they’re full to demonstrate that we’re all born Intuitive Eaters. And I still believe that’s true. But I now realize it doesn’t tell the whole story. Babies also like to feed for comfort. (Of course not all babies. Just like food doesn’t lead to a dopamine pleasure hit for all adults. For some, maybe it’s video games, shopping or whatever.) But it makes sense that it’s incredibly human to soothe and comfort ourselves in the way we know how. The other night my husband came home from work and said, “Man, I had a tough day. I need some comfort food tonight. Can we do spicy chicken pho for dinner? And coffee Haagen Daaz? That sounds sooo good.” And then he proceeded to enjoy his comfort foods, feel satisfied, and move on. Zero guilt. Zero judgment. He even enjoys his ice cream straight out of the container. Emotional eating becomes problematic when food is the only way you have to cope. Rather than seeing emotional eating as THE problem, consider seeing it as a sign you’d benefit from building your toolbox. So I say welcome your emotions to the table. But lose the unhelpful food guilt and self-judgment. Comfort foods can absolutely have a healthy place in your life. And if you identify as an “emotional eater,” consider identifying as a “human being coping with life’s challenges the best way you know how.” We’re all the same that way. p.s. 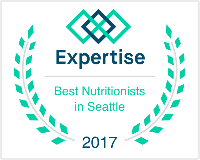 If you suspect emotional eating is a problem in your life, having the support of both a therapist and Intuitive Eating dietitian/certified nutritionist can truly be life-changing. Contact me and I’d be happy to help you get started with either. Whether it’s myself or someone else in your area or who takes your insurance, I know good peeps. Say, you got a nice forum topic.Really looking forward to read more. Want more. What you eat, and how you think and feel, immensely influence your overall health and happiness. Fuddhism – the new philosophy I follow is merging food and mind. Very interesting article =) It’s true that your emotional state has a serious effect on your diet. We have to become more mindful and not let the blues lead to health issues. Guilt and self-judgment can be the fuel that sparks a full-out binge. Thanks for explaining this emotional eating issue so clearly!